If you haven’t installed Fox yet, read up on Installation. This tutorial will use the Objective-C API of Fox. There is a similar Swift API but that’s currently alpha and subject to change. Fox takes these parts and separates them. Inputs are produced using generator. Generators describe the type of data to generate. Behavior to test remains the same. The assertion is based on logical statements of the subject and/or based on the generated inputs. The assertions as usually describe properties of the subject under test. Let’s see how we can convert them to Fox property tests. To convert the sort test into the given property, we describe the intrinsic property of the code under test. FOXInteger is a generator that describes how to produce random integers (NSNumbers). FOXArray is a generator that describes how to generate arbitrary arrays. It takes another generator as an argument. In this case, we’re giving it an integer generator to produce randomly sized array of random integers. FOXForAll defines a property that should always hold true. It takes two arguments, the generator to produce and a block on how to assert against the given generated input. FOXAssert is how Fox asserts against properties. It will raise an exception if a property does not hold. They’re part of Fox’s runner infrastructure which actually generates all test cases. Assert that for all array of integers named integer, sorting integers should produce sortedNumbers. sortedNumbers is an array where the first number is the smallest and subsequent elements are greater than or equal to the element that preceeds it. The rest of the first half of the failure describes the location and property that failed. seed is the random seed that was used to generate the series of tests to run. Along with the maximum size, this can be used to reproduce failures Fox generated. maximum size is the maximum size hint that Fox used when generating tests. This is useful for reproducing test failures when paired with the seed. number of tests before failing describes how many tests were generated before the failing test was generated. Mostly for technical curiosity. size that failed describes the size that was used to generate the original failing test case. The size dicates the general size of the data generated (eg - larger numbers and bigger arrays). shrink depth indicates how many “changes” performed to shrink the original failing test to produce the smallest one. Mostly for technical curiosity. shrink nodes walked indicates how many variations Fox produced to find the smallest failing test. Mostly for technical curiosity. value that failed the original generated value that failed the property. This is before Fox performed any shrinking. smallest failing value the smallest generated value that still fails the property. This is identical to the value on the first line of this failure description. For integers, that means moving towards zero. For arrays, each element shrinks as well as the number of elements moves towards zero. Each time the value shrinks, Fox will verify it against the property to ensure the test still fails. This is a brute-force process of elimination is an effective way to drop irrevelant noise that random data generation typically produces. Notice that the last element has significance since it failed to shrink all the way to zero like the other elements. Also note that just because a value has been shrunk to zero doesn’t exclude it’s potential significance, but it’s usually less likely to be significant. In this case, the second to last element happens to be significant. Due to the maximum size configuration. Fox limits the range of random integers generated. Fox’s default maximum size is 200. Observe when you change the failure case to require more than 200 elements for the sort example. See Configuring Test Generation for more information. If you want a more thorough exercise of the full data range, use the famous value generator variants - FOXFamousInteger. Now this is all well and good for testing purely functional APIs - where the same input produces the same output. What’s more interesting is testing stateful APIs. Before we start, let’s talk about the conceptual model Fox uses to verify stateful APIs. We can model API calls as data using Fox’s generator system. Which API calls are valid to make at any given point? This is specified in Fox as preconditions. What assertions should be after any API call? This is specified in Fox as postconditions. This is done by describing a state machine. In basic terms, a state machine is two parts: state and transitions. State indicates data that persists between transitions. Transitions describe how that state changes over time. Transitions can have prerequisites before allowing them to be used. 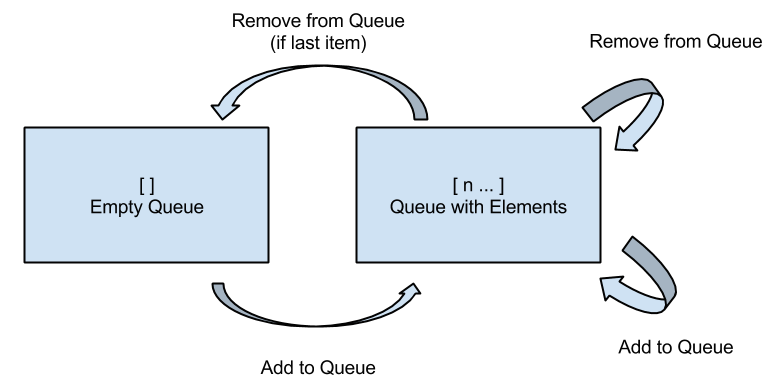 For this example, we can model the API as a state machine: with transitions for each unique API call, and its state representing what we think the queue should manage. In this case, we’ll naively choose an array of the queue’s contents as the state. From there, Fox can generate a sequence of state transitions that conform to the state machine. This allows Fox to generate valid sequences of API calls. // define the state machine with its initial state. // we'll only be using randomly generated integers as arguments. // note that nextModelState should not mutate the original model state. // subject is the subject under test. You should not provoke any mutation changes here. // generatedValue is the value that the removeTransition generated. We're not using this value here. // returnedObject is the return value of calling [subject removeObject]. // verify that all the executed commands properly conformed to the state machine. If you prefer to not have inlined transition definitions, you can always choose to conform to FOXStateTransition protocol instead of using FOXTransition. We can now run this to verify the behavior of the queue. This takes more time that the previous example. But Fox’s execution time can be tweak if you want faster feedback versus a more thorough test run. See Configuring Test Generation. Testing a queue with this technique has obvious testing problems (being the test is like the implementation). But for larger integration tests, this can be useful. They just happen to be less to be concise examples. [subject removeObject] -> (null) (Postcondition FAILED) - out of bounds exception raised. You may be wondering why the removeObject call is still required. This is the only way assertions are made against the queue. Just calling addObject: doesn’t reveal any issues with an implementation. If you want read on, continue to the core of Fox’s design: Generators.